Britax Kid Plus | What Car? No cupholders, but there are armrests to keep your child comfortable, and the width of the seat can be adjusted as they grow. The backrest is also adjustable to ensure the best possible fit in the widest range of cars. The seatbelt guide is hidden away with the head section in the lowest position, but it's very easy to adjust this and slip it through. Covers are easy to remove and, like all of the group 2/3 seats here, it takes just seconds to remove the back section and turn it from a group 2 to a group 3 seat. Another pricey model, but the Britax does feel well made, even if it isn't packed with lots of fancy features. 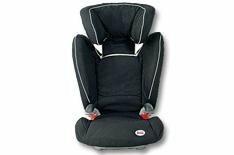 The construction of the Britax feels top drawer, while the materials used are also extremely good.